“Oh, so you’re illegal,” one of the agents replied, she recalls. They asked if she is a citizen. She refused to answer. She had provided her Louisiana drivers license, name and date of birth — enough to check databases and verify her status. 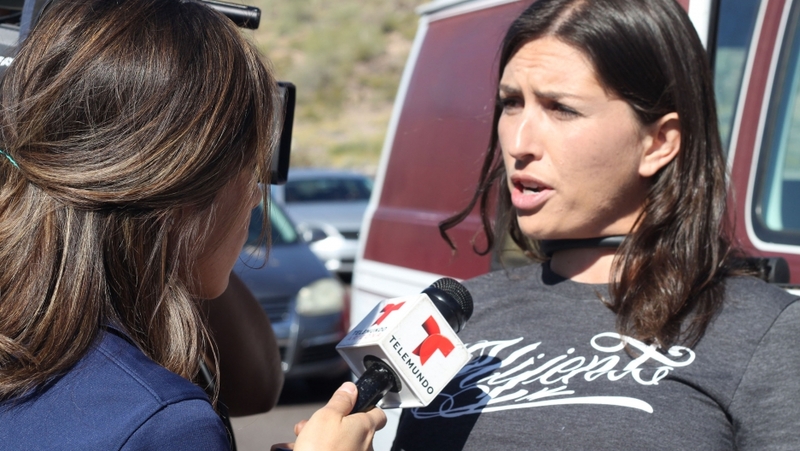 The agents then told her that they were issuing an immigration detainer, which is a request by ICE for the Maricopa County Sheriff’s Office to hold a suspect and turn him or her over to immigration officials once they complete their investigation. Chris Hegstrom, the director of public information for the Maricopa County Sheriff’s Office, says this was all standard procedure. The ICE agents are stationed at the Fourth Avenue jail and question everyone who comes through, he says. The two other protestors, both white men, told The Republic they were never questioned by the agents nor were they asked about their immigration status. About 8 p.m., the three protestors were seen by a judge. They were released on their own recognizance and will face misdemeanor charges for obstructing a highway. By late that night, 11 p.m. or midnight, Gonzalez estimates, the jail finished processing them. The two other protestors were released; Gonzalez was kept in jail overnight, in isolation, she says.